Adrianna Radice is a senior staff writer for Achona. This is her first year on staff, and, driven by her love of writing, she is looking forward to learning about the world of journalism. 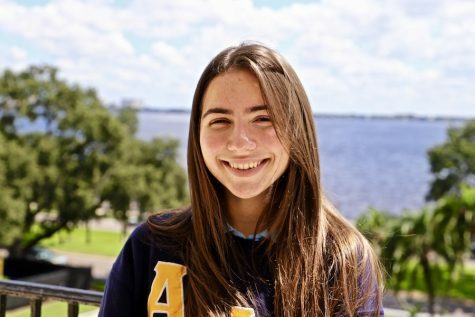 She is a member of Ambassadors, a club at Academy of the Holy Names that travels to different schools and explains to eighth graders, who are deciding where to attend high school, the many benefits of attending AHN. Adrianna’s love for AHN makes her reluctant and scared for college. The application process is the most stressful part for her, at the moment. Although Adrianna never wears makeup to school,she uses makeup as an art form to create new looks and try new products. Also, her all-time favorite comedian is John Mulaney. She enjoys participating in theatre. Her two most recent productions have been the one act "Trifles" and "The Girls of the Garden Club", which, in both, she had a leading role. During her free time, she likes to be with her friends and family. Adrianna is especially close with her younger brother, Kevin. Reading and listening to music helps her relax and escape from the stress of school. She makes Spotify playlists dedicated to people she admires, consisting of one hundred songs each. For instance, her love of the Marvel movie franchise and superheroes has sparked playlists dedicated to characters such as Bucky Barnes, played by Sebastian Stan. Adrianna has a passion for social justice. She attended the Women’s March in St. Petersburg, Florida and the March for Our Lives, hosted in Downtown Tampa, Florida. Understanding where other people are coming from and speaking up for those who do not have a voice makes up a huge part of who Adrianna is. She does not sit back and watch, but she participates and voices her opinion on different issues.